Trend Title:"THE SPA ON RODEO"
There is a place on Rodeo Drive in Beverly Hills that you may not have spotted walking by but it's a great little hideaway. The Spa On Rodeo is an oasis that feels worlds away from everyday life where they focus on wellness (and making you look and feel better) It's a luxury, boutique spa located right in the middle of Rodeo. The spa was created by Board Certified Foot and Ankle Surgeon Dr. Bobby Pourziaee with the intention of creating wellness from the ground up. As the founder of Rodeo Drive Podiatry, Dr. Bobby (as he's known) is a believer that healthy feet are the foundation of optimal well-being. The foot business grew from there. The treatments are designed to heal and soothe your body and mind. They have signature healing foot soaks or paramedical skin revision treatments, and their goal is providing a one-of-a-kind atmosphere. They specialize in pedicures among other things. You soak in raw copper basins where soaks are infused with detoxifying chlorophyll and soothing coconut milk. You choose from an essential oil blend of eucalyptus and lemongrass or calming chamomile and lavender. 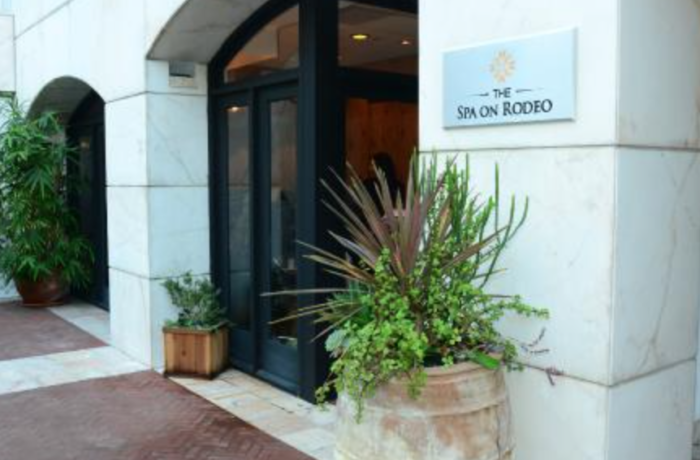 The famed Rodeo Pedicure includes the benefits of a classic pedicure paired with warm paraffin dip, retexturizing enzyme mask and a foot reflexology treatment. Management says feet are left silky smooth and relaxed with perfectly polished or buffed nails. There is also the Rodeo massage: Swedish, Deep Tissue, Trigger Point Therapy, Stretching, Myofascial Release, Lympathic Drainage, Sports and Prenatal. Hot Stone Massage is a soothing massage using heated basalt stones and therapeutic essential oils to detoxify and relax. Renowned for their healing capabilities, strategically-placed basalt stones create deep muscle penetration to help ease tension and tightness. Cranial Sacral, a form of energy massage is also offered, which utilizes the listening stations of the body, as well as sole reflexology. One of their signature services is Cupping, an alternative medicine practice which dates back as early as ancient Egyptian, Chinese and Middle Eastern cultures. The use of cups allows for the stretching and opening of muscle tissue. ( I swear by cupping when I get a cold as it clears me up like nothing other) The lifting creates space to drain toxins from the cells and remove waste through the lymphatic system. It is also said to be effective against depression, anxiety, high blood pressure and chronic joint conditions. Cupping is also available for the face, cellulite, belly and feet. In their treatments, they use 100% certified organic skincare products with all-natural healing ingredients extracted from nature to gently revise sensitive skin conditions. A feel-good facial using our organic skincare serves up all the perks of red wine which is rich in tannins to thoroughly purify the skin and neutralize free radical damage. In addition to our spa treatments, they also offer Juvederm, Botox, spray tanning, body contour wraps and stretch mark revision. They also do beauty Happy Hour gatherings with cocktails, services and mingling. Great idea!